Did you read the Guardian article, published a couple of weeks ago, entitled The Eeriness of The English Countryside, by academic and bestselling travel writer Robert Macfarlane? In it, he name-checks masters of that particular kind of horror, the English Eerie: that is, the unease and uncanny forces felt when wandering our ancient fields and coastlines. People like M.R. James are discussed (whose ghost stories, Macfarlane confesses, have “caused me to wake myself with my own screaming”), in addition to more contemporary eerie offerings from PJ Harvey, in albums White Chalk (2007) and Let England Shake (2011), and Ben Wheatley’s “brilliant” A Field in England. And then someone more familiar crops up. It did indeed turn out to be one of our most regular film critics — Scovell has written about everyone from Jen-Luc Godard to Ken Russell for us since 2012, as well as pursuing a PhD and freelance filmmaking. Recognising Scovell’s talents after stumbling upon his popular blog, Celluloid Wicker Man, Robert Macfarlane emailed Scovell out of the blue to discuss his work and, in particular, a common interest in the English Eerie. 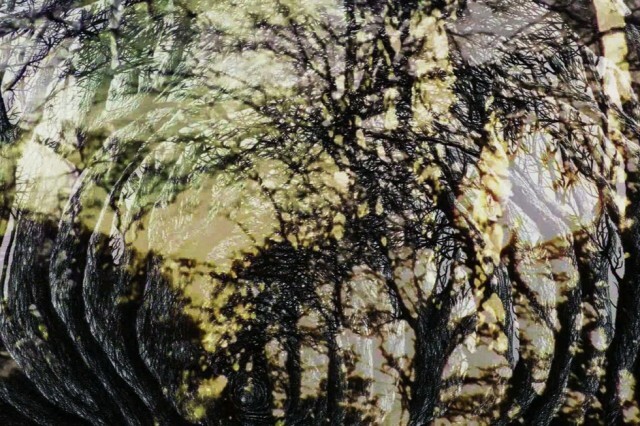 As their conversation developed, a short adaptation of Macfarlane’s 2013 bestseller, Holloway (featured on both the Observer and Sunday Telegraph’s Books of The Year) was agreed upon and things moved swiftly from there on in, including gaining permission to use the work of English artist Stanley Donwood, aka Dan Rickwood: responsible for all of Radiohead’s album and poster art since 1994. Did Scovell feel like he was dreaming? ”I was exploring in Switzerland and getting away from a lot of stress when he first emailed. It felt more of a surreal life-line than dreaming. I’d had a lot of knock-backs from local musicians in regards to visual collaborations, a lot of writing knock-backs and some tough criticism for my PhD applications at the time. “The short is “about time-loops and unexplained occurrences”"
Filming in the dead of winter, Scovell encountered that particle type of dread, which Macfarlane describes as a “swarming in the stomach’s pit, the tell-tale prickle of the skin”. Filming alone, without a crew and seeing hardly any passers by for three days, was a much harder prospect than originally expected. He even got stuck for hours in a muddy Holloway with no way out other than through thicket, equipment and all. Looking through the stills taken at the film location recently (and showing us some angry bramble scars) Scovell pointed out a dark shape at the end of the Holloways that he swore wasn’t there whilst filming. Or he didn’t think so, anyway (he laughs). It’s a weird echo of Scovell’s entertaining (and autobiographical?) film The Coastal Path, which follows a young filmmaker who accidentally captures a ghost on Super 8. This English Eerie, we found out, is insidious. We’re still feeling that “tell-tale prickle of the skin”. What reaction, we wonder, does Scovell expect from the release of the full film, due at some point this year? ”I just hope people who liked the book and Robert’s writing in general will find something of interest in the film, even though they are very different forms. I do know that if people come to it expecting some sort of Countryfile episode on Dorset Holloways, they’re going to be extremely bewildered. What is so fascinating, so gripping about the notion of the English Eerie is that it turns everyday, surrounding spaces into ones of creeping fear and danger. Nowhere is safe, no matter how alluring. It is seeing, as Macfarlane puts it, the “English countryside not only as a place of beauty, calm and succour, but also as a green and deeply unpleasant land.” And in the form of Holloway, we can’t wait to see the results.